It’s always fun to be with my British husband and celebrate the 4th of July. Some of his favorite questions he been asked many times since moving to America to be with moi is, “So, Jonny, what’s Thanksgiving like in England! ?” or “How do you guys celebrate the 4th of July in England!?”. Such silly questions – some of us need to be reminded of our history sometimes! But every year around this time my family loves to wave flags (nobody waves a flag better than an upstanding American citizen! ), laugh and say “nanny-nanny-boo-boo” in my poor British husbands face. It’s a real sweet, bonding moment and Jonny hasn’t gone postal on our a$$es yet! Just to remind all of you US-history-challenged readers, Americans celebrate the 4th of July each year commemorating the final f-you to the British in declaring our independence from them. So, celebrate the day with a cook out, some bunting, fireworks, sparklers, a Brit to make fun of and this delightfully delicious Nectarine Tart. The reason why this is so delicious and weirdly light is because the filling isn’t made with custard, it’s actually made with simple whipped cream mixed with Cointreau and topped with poached nectarines. Maybe you can swap the nectarines out for some raspberries, cherries or strawberries and really make this a 4th of July spectacular! Super easy and very, very, very tasty, we cheated and used some frozen pastry (gasp!!! Y’all know i’m a cruddy baker! ), but feel free to use your favorite pastry recipe. We took this straight from a wonderful book, “When French Women Cook: A Gastronomic Memoir” by, Madeline Kamman. HAPPY FOURTH OF JULY – HAVE A WONDERFUL WEEKEND! Roll our your pastry to fit a 9-inch pan. Blind bake for 10 minutes at 425 degrees. Remove from oven and allow to cool. Bring a pot of water to a boil and immerse nectarines in for 1 to 2 minutes, allowing you to peel the skin off more easily. Peel and cut in quarters to remove the stone then slice into thin pieces. Make a syrup with 1/2 a cup of water and the sugar and poach the nectarine pieces all together. Allow to cool. Whip the cream gradually adding the sugar and 1 tablespoon of the liquor at a time. When the cream is stiff, fill the pastry shell with it. Top with cooled nectarine syrup and then the blackberries. ENJOY! Wow, that’s beautiful! Happy 4th to you too! Beautiful tart. Really special for this hoilday. LOL, I forget that the rest of the world knows very little of our festive 4th of July. The tart is just perfect for America’s B-day! Nectarines are fabulous, we grilled some last week and are doing some more today! Cute post! Happy Fourth of July to you too! What a gorgeous-looking tart! 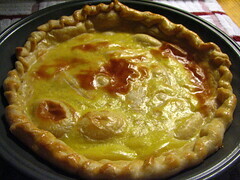 Tarts are always on my wish list, long on the yearning but short on the determination to make. Just seems so intimidating. I love, love the colours on this tart, the yellows and the deep purple almost to black. …and that tart! I love nectarines! Tarts are so versatile. Nicely done. This looks absolutely heavenly! Happy 4th! Tui had a link to a very, very irreverent take on the British/American thing on the 4th that was up on her daughter’s blog. Hey at least Jonny can ask your relatives what they’re doing for Guy Fawkes Day and get similarly blank stares. Good times. 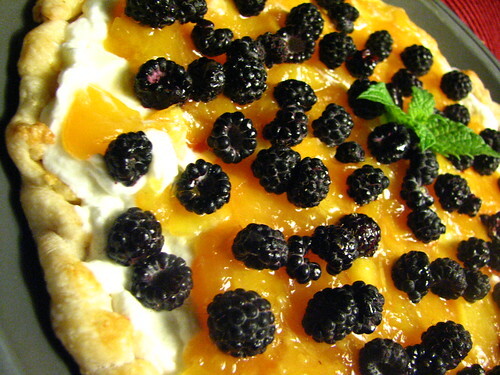 Nectarines and blackberries. Great combination! This is my type of pie! Looks so beautiful and is full of yummy yums! Looks like it is easy to make too. Printing it:) Happy belated 4th of July to you too! Mmmm, Thats a delicious looking tart! Yes, I’m with you on the pastry too! oooh look at that! i’ve been instructed to blog something sweet too. yum! happy fourth to you all, and thank you, as always for the kind comments. the most peculiar thing about fourth of july is for me (it’s Jonny) is that some people actually expect me to be annoyed at America celebrating its independence because I’m British. Little do they know but I’m delighted about it when it falls on a week-day! and, canary girl, we celebrated it with you. Que feliz! Would have loved to be in Madrid to join the party. Cañas all night on the street! That looks so beautiful, simple, and rich. It’s a reminder that I know a spot where wild blackberries grow in abundance and they’re coming to their peak. 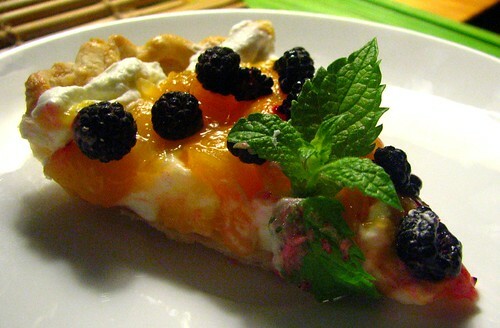 This tart sounds delicious and your photos are divine! congrats on making the FFF!